Determine the foot type and correct shoe size in just 15 seconds. The colour footprint on the thermally sensitive surfaces (thermo-foil) is visible immediately – it doesn’t get any more straightforward than this! 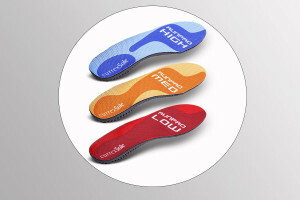 Simply place your customers feet (even with socks) on the footdisc and the contact areas change colour, clearly indicating their “foot type” and length, then observe their ‘leg axis’. Once you have both, use the ‘Chart’ to recommend a shoe category. It’s rather like the ‘wet test’ but more accurate and without the mess. Special thermo-dynamic crystals in the device change colour when exposed to body heat and this clearly indicates your foot type. Your foot type provides an insight into its dynamic function and thus aids shoe selection. When cross-referenced against static leg axis the accuracy of your shoe selection improves. 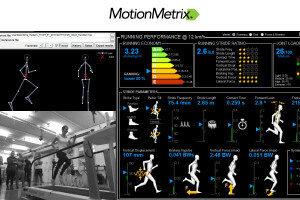 Static foot type and leg axis interact in a uniform manner. By cross-referencing the two we can accurately predict dynamic foot function and the accuracy of shoe selection improves markedly. Each FOOTDISC device comes with two ‘analysis flow charts’ describing the patented shoe and insole selection process (combination of leg-axis and foot type – flat, low arched, normal and high arch). This patented FOOTDISC selection process (patent no. EP1844709) enables a fast and easy shoe and insole recommendation. By comparing the customer’s ‘foot-type’ and ‘static leg axis’ with those on the charts you can determine your customer’s ‘shoe type’ – Cushioning, Stability or Control – within seconds. Each FOOTDISC is accurately calibrated to measure your clients ‘foot-length’ and running shoe size can be determined against the scale with all current measure norms. You only have to wait 30 seconds after each measurement to start the next. To use the FOOTDISC® no biomechanical knowledge is needed. It can be used by everyone – in your shop or at events. No power is required – it is simple, mobile and easy to use. Each footdisc©comes with ‘shoe type’ stickers to use within the storeroom – enabling easy identification of ‘shoe type’ for those who do not have the time to keep updated with the latest running shoes. FOOTDISC is an ideal introduction into gait analysis. FOOOTDISCS are supplied with replaceable thermo-foils, an instruction manual and two analysis flow charts. A robust, padded shoulder bag is also available as an extra. FOOTDISC SMU device without logo. The Footdisc device can be branded with your logo and colours.